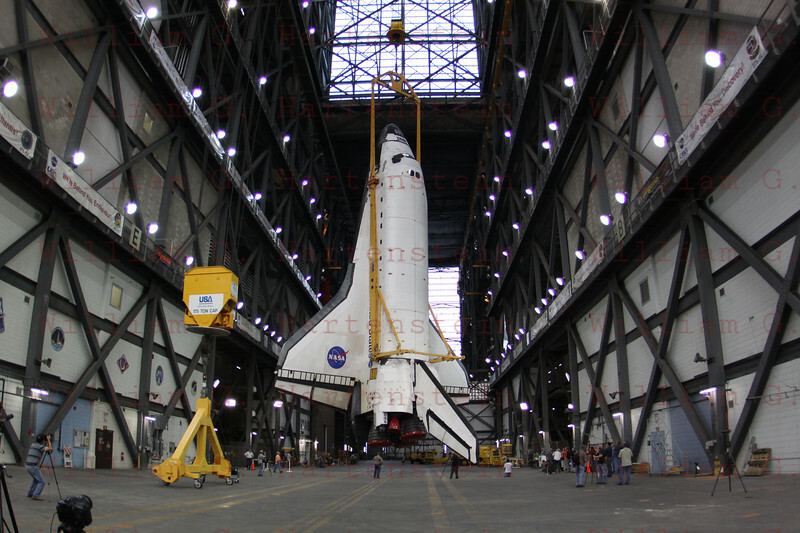 CAPE CANAVERAL, Fla. -- In Vehicle Assembly Building at NASA's Kennedy Space Center in Florida, an overhead crane suspends shuttle Atlantis above the transfer aisle. The spacecraft will be moved into a high bay where it will be lowered and attached to its external fuel tank and solid rocket boosters already on the mobile launcher platform. Commander Chris Ferguson, Pilot Doug Hurley and Mission Specialists Sandra Magnus and Rex Walheim are expected to launch in mid-July, taking with them the Raffaello multi-purpose logistics module packed with supplies, logistics and spare parts.